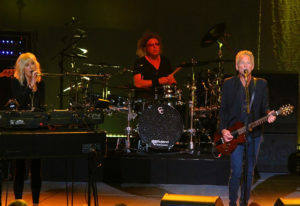 Two-fifths of Fleetwood Mac’s classic “Rumours”-era lineup threw everything they had into their Aug. 5 concert in Tulsa, Okla.
Guitarist-singer Lindsey Buckingham and keyboardist-singer Christine McVie brought their new U.S. tour to a near sellout audience at River Spirit Casino’s Paradise Cove, and with the help of a quartet of backup musicians, kept energy and musical sounds at a high level. The sloped, indoor venue was the perfect setting for Buckingham and McVie to show off their musical dexterity and dig deep into new songs from their recently released, self-titled album, as well as some choice Fleetwood Mac numbers that continue their shine, year after year, radio play list after radio play list. “Trouble,” Buckingham’s first solo hit single that hit airwaves in 1981, emitted from the stage first, with Buckingham’s patented, glorious finger-picking style magically creating the sound of three guitars. The track’s tempo was slow and easy, allowing Buckingham multiple sound-pocket spaces so his singing voice could alternate between authoritative narrator and whispering nature. Fleetwood Mac fans also were treated to a solid version of “Little Lies,” a rarely played Mac song that dates back to the group’s “Tango in the Night” long-player. For a few seconds here and there during “Little Lies,” the vocals of the stars and their supporting personnel sounded a bit bumpy, but when the group played Fleetwood Mac’s “Hold Me,” the vocals and instruments sounded drop-dead incredible. “Tusk” and “Never Going Back Again” also hit their marks with expert playing and singing, and “I’m So Afraid” benefited greatly from Buckingham’s mad-man vocal howl and guitar-string slashing. Buckingham’s abilities as a guitarist have yet to diminish, and his trademark stage presence of pretending to stomp around the stage at varying degrees of speed while performing, thankfully, remains intact. Although not quite as powerful as Fleetwood Mac’s best work, the new duo songs were able to gain traction on the Tulsa stage. “In My World” summoned applause usually reserved for hit-single compositions, and “Shut Us Down” possessed an aching-beauty quality Buckingham fans have long come to expect. Some long-time followers might fear that they will miss the presence of the duo’s fellow Fleetwood Mac members Stevie Nicks, Mick Fleetwood and John McVie on this new Buckingham/McVie tour, but there’s something refreshing about seeing these musicians temporarily step away from Fleetwood Mac’s mighty shadow. In a way, Lindsey and Christine seemed more relaxed doing the duo show, as did Steve Nicks during her March appearance at Tulsa’s BOK Center. These solo and duo gigs allow the artists to be a bit more chatty at the mic. There certainly were laughs exchanged between Lindsey and Christine. The moment when Christine casually stepped to the left of her keyboard and pretended to strum the strings of Lindsey’s guitar in mid-song was bona-fide gold. Yes, friends, the magic is back again.